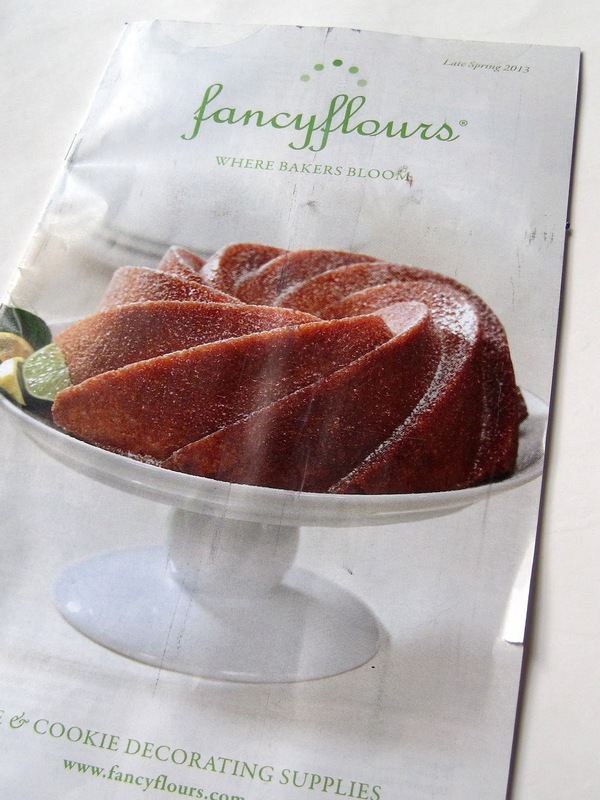 Do any of you get the Fancy Flours catalog? 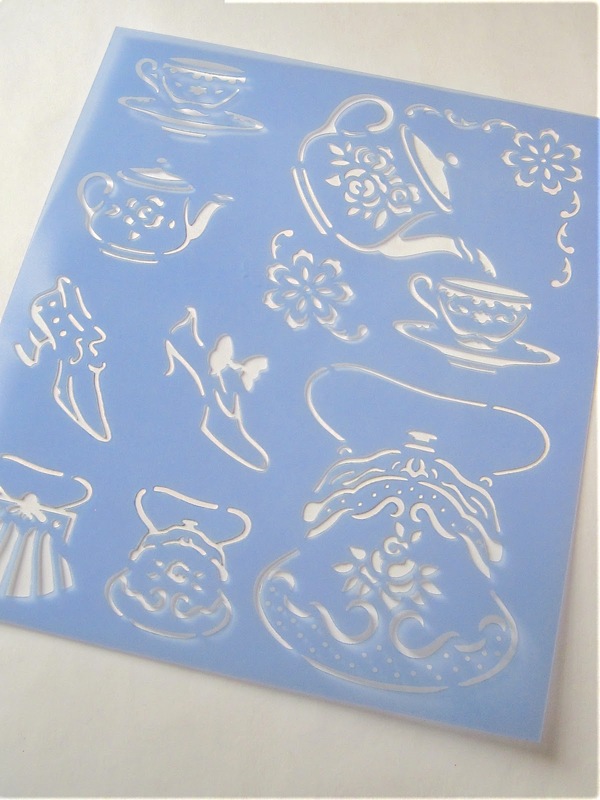 I finally placed an order from them not long ago (a small teapot cookie cutter), so now I'm on their mailing list and happy every time a new catalog arrives! 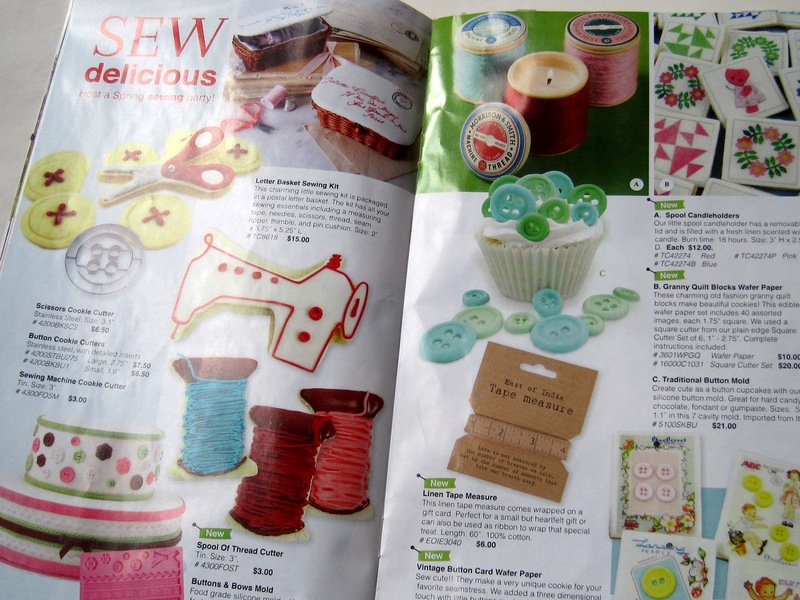 If I ever get serious about my stitching again, I think it would be great fun to hold a sewing-themed tea party. Aren't these treats delightful? I especially like the spool of thread cookies at left. I love how the icing looks like individual threads. But what I really wanted to show you was their new Blue Willow wafer papers! Now yes, I've heard of these edible papers that you apply to iced sugar cookies, but I must confess I'm scared to give them a try. Any of you have experience with this technique? 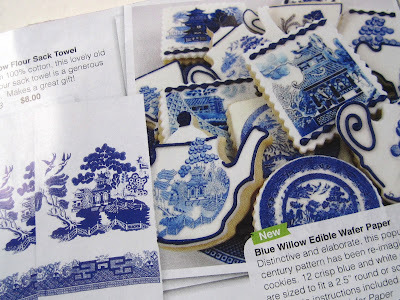 I think these are just the prettiest sugar cookies ever, and eventually I simply must give them a try! Last Monday's post was a trial balloon. 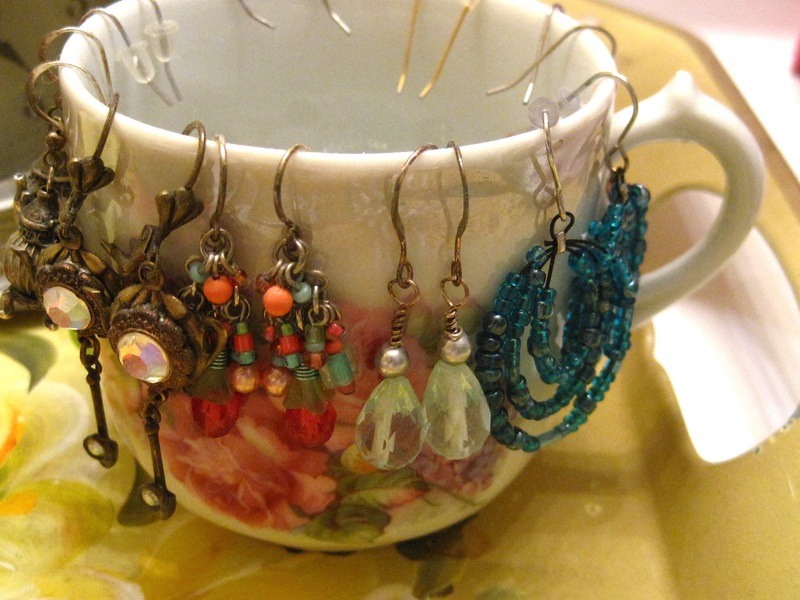 If y'all didn't think I was nuts for using teawares in the bathroom, then perhaps you would consider the possibility of using teawares as jewelry storage. Over the weekend, I got a bee in my bonnet to create a little vignette using a table that's been aimlessly wandering around the house. Originally it was in the dining room, and then I decided it would be lovely as a gussied-up "potting shed" table in the utility room. It was indeed lovely. Unfortunately, it was in too small a space so we could no longer open the dryer. And so the table was homeless again. Finally, I decided it would find a home as a new vanity table! Already I had called some of my glass, china and silver into service as jewelry organizers. 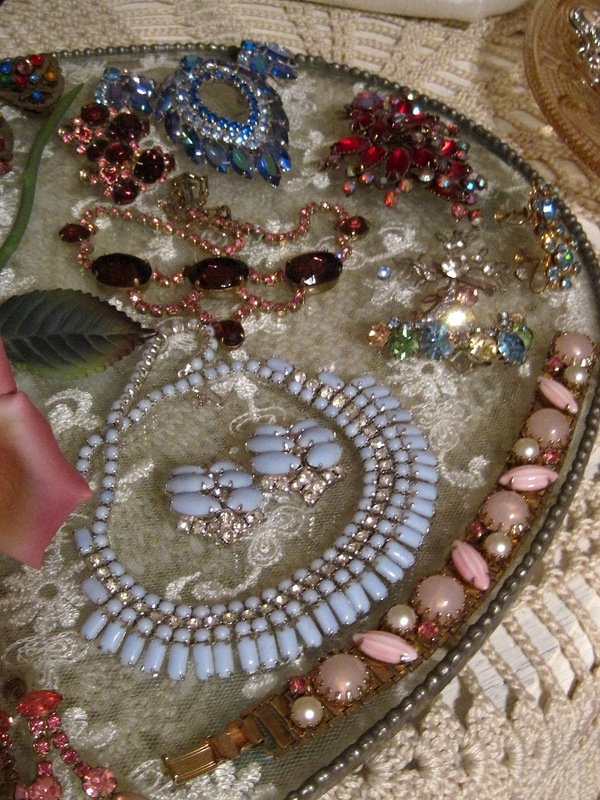 This pink glass tidbit tray from Tiara? That handle is just dying to hold bangle bracelets in place. Trust me on this. Got a chipped candleholder? I did, but I loved the pink glass and the prisms. 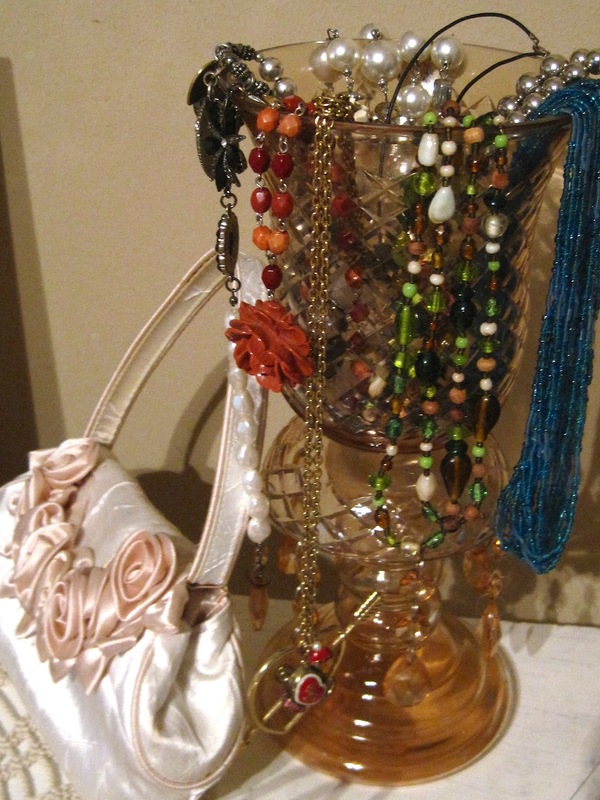 Throw some necklaces over it and voila, a free jewelry stand. 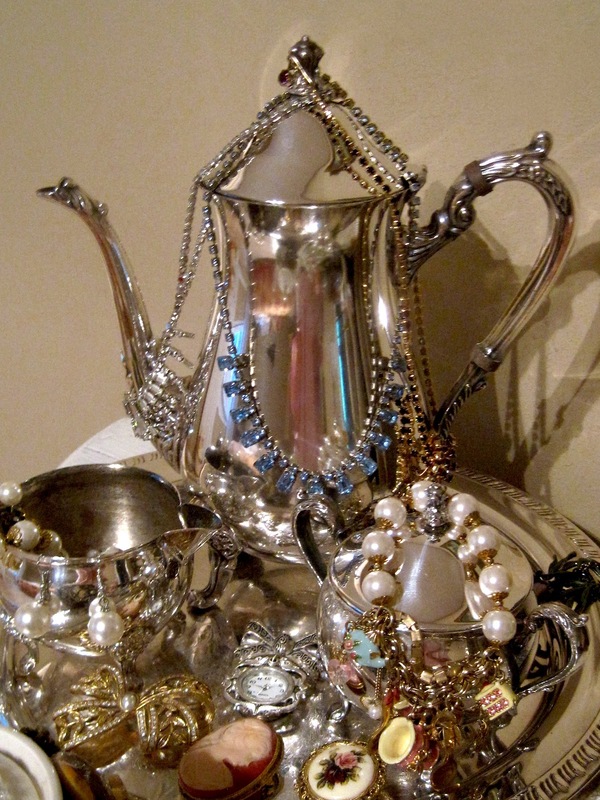 My favorite jewelry display idea, though, was this silverplate tea set the DH got for me at a yard sale a few years back. Now I just adore the few old rhinestone necklaces I own, and I so enjoy looking at them. Nowadays you can buy black velvet (and pink velvet!) displays at the craft stores, but before those appeared I decided to drape my jewels across this silver. It's only a few pieces here, really, but it looks so lavish! I think I'm going to skip the black velvet. 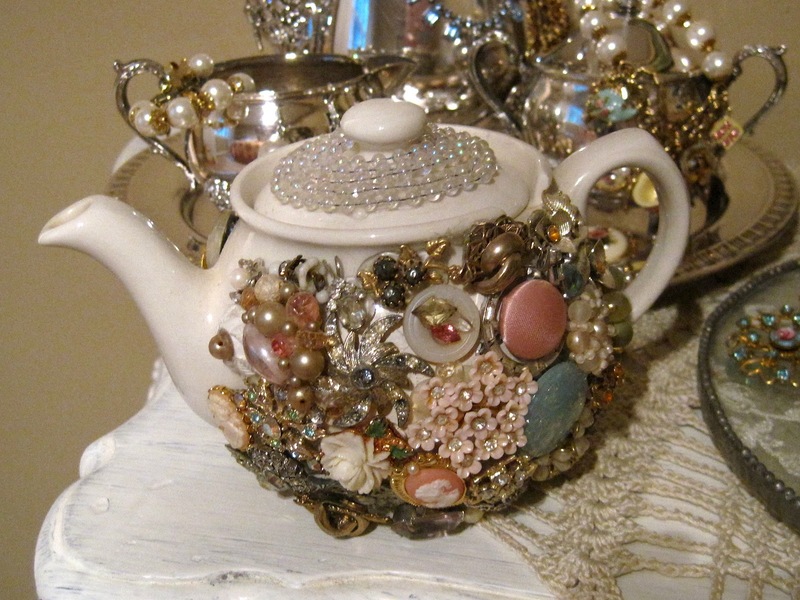 And I showed this back when I first made it, but my bejeweled teapot was, in fact, too heavy to actually use, so I gave it a home near some other jewelry. 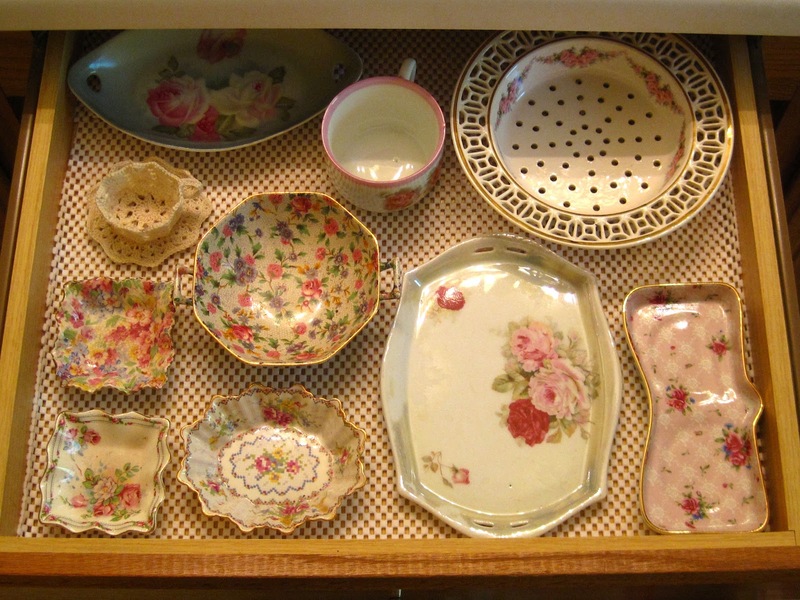 Got tea trays? I do. 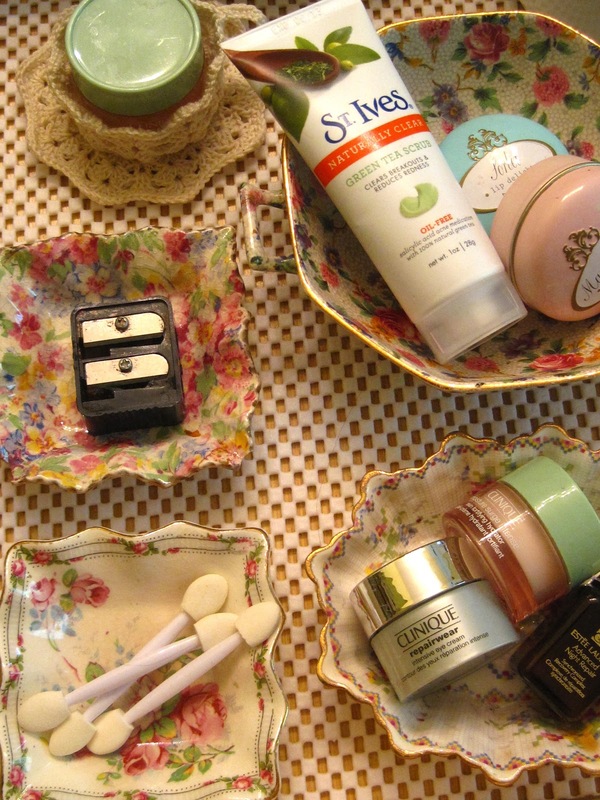 More than I'll ever need, no doubt, and these lace-under-glass ones are some of my favorites. 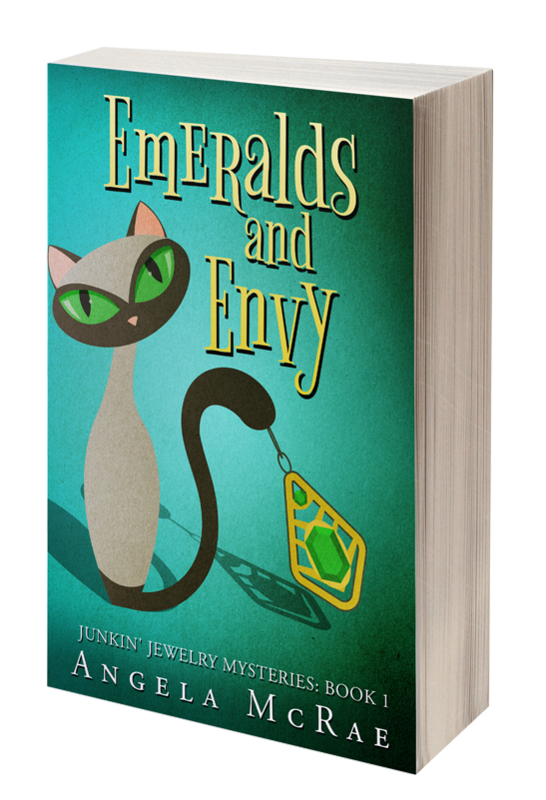 When they're not serving cookies, they're serving costume jewelry! 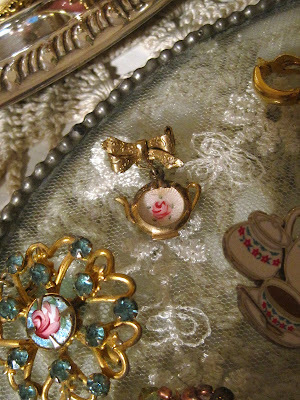 This tiny little cloisonne teapot pin remains a favorite piece. It's old and weathered and has character, I think. Finally, I've shown this idea before, but I switched out the teacups recently and it occurred to me new readers of this blog might enjoy seeing a different way to display French ear wire earrings. 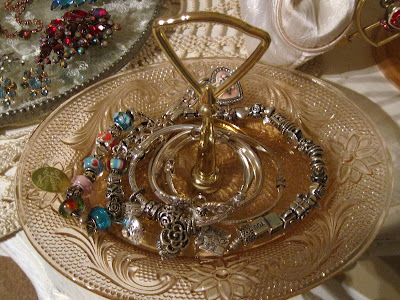 Do any of you use teawares for jewelry display or storage? Please let me know any ideas I've missed! 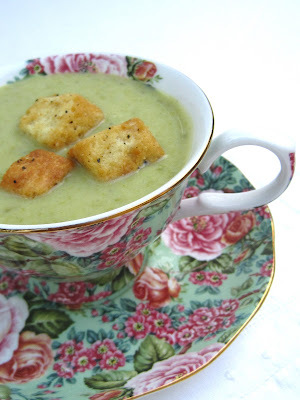 Spring seems to turn my tastebuds toward vegetables even more than usual, so this week I decided to try a tempting-sounding asparagus soup recipe. The recipe itself was a delight to make largely because of the happy manner in which I received it! Not long after I began posting tea room recipes each Saturday this year, a surprise package turned up in my mailbox from tea friend Margie in California. 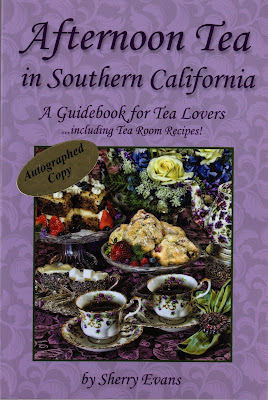 Inside was this wonderful autographed book, "Afternoon Tea in Southern California" by Sherry Evans. Oh, to live in a state with as many marvelous tea rooms as California apparently has! 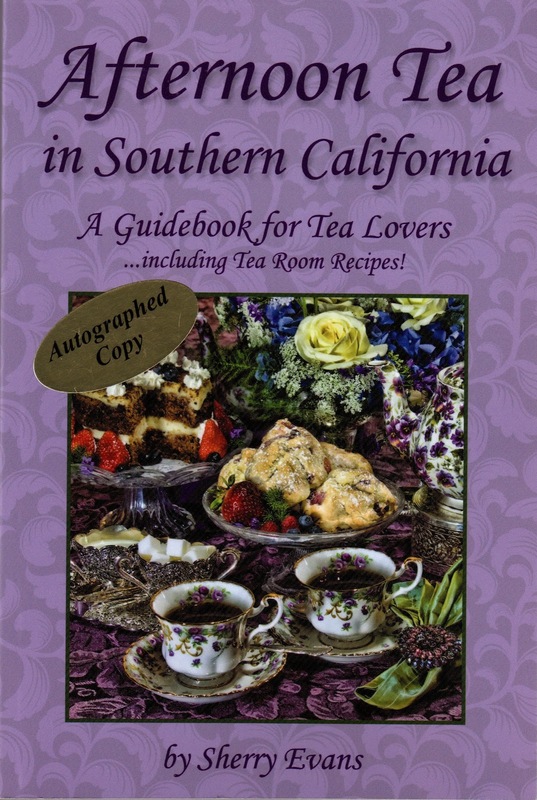 This book includes photos and descriptions of the tea rooms featured, and in a brilliant move its author has also included a note page with each tea room so visitors can take the book with them and make notes on tea rooms visited. I treasure my copy from Margie, and it's the source of this week's recipe, with a few minor tweakings! In a soup pot, sauté the onion in the margarine over medium heat for about 5 minutes, just until transparent. Add flour and blend well. Whisk in chicken stock and make sure all the flour is dissolved. Add asparagus, potato, salt and pepper. Bring to a boil, then let simmer, covered, for 20 minutes. Allow to cool for 10 minutes. Spoon mixture into food processor and puree in small batches, then strain off the asparagus fibers. (If you have a large strainer, you may use that to strain off the rough fibers from the asparagus; I do not have that large a strainer, so I found a colander with smaller holes that worked well.) Return strained soup to pot, add evaporated milk and cook on low heat to prevent the milk from scorching. 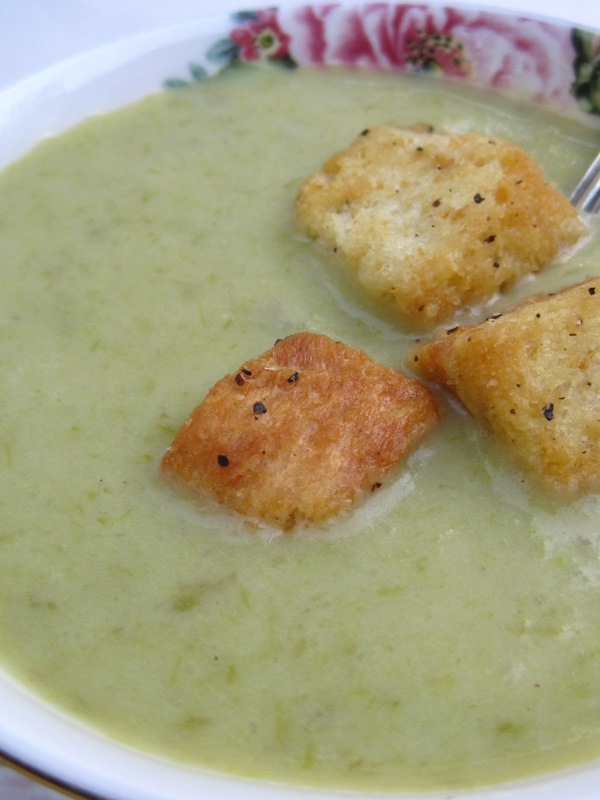 Serve with croutons. 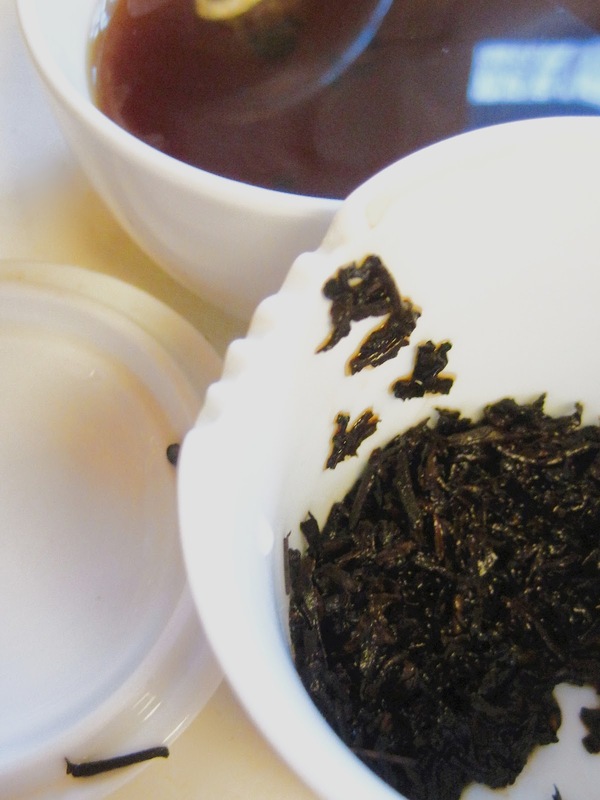 The original recipe yields 15 (8-ounce) servings and is said to freeze well. I halved it and the DH and I ate it up in three days. So I can't tell you if mine would freeze well or not, but it was certainly a rich, satisfying, taste-of-spring soup! Yesterday, I was sipping citrus in my tea. 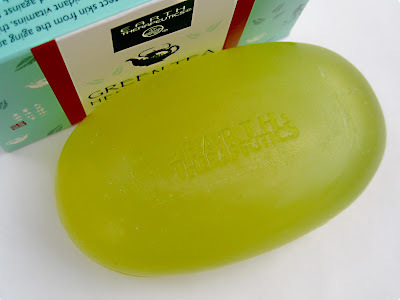 Today, you might say I am "soaping" citrus and tea! 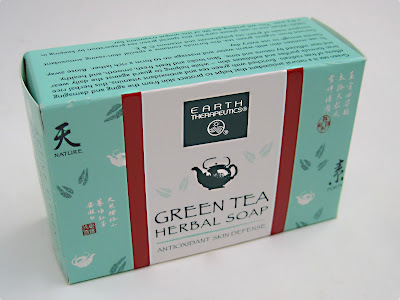 My friend ParTea Lady recently reviewed this soap, and I was so impressed I had to find some for myself! She found hers at Ross (three bars to the box), and I found just a single bar at T.J. Maxx for $2.99. 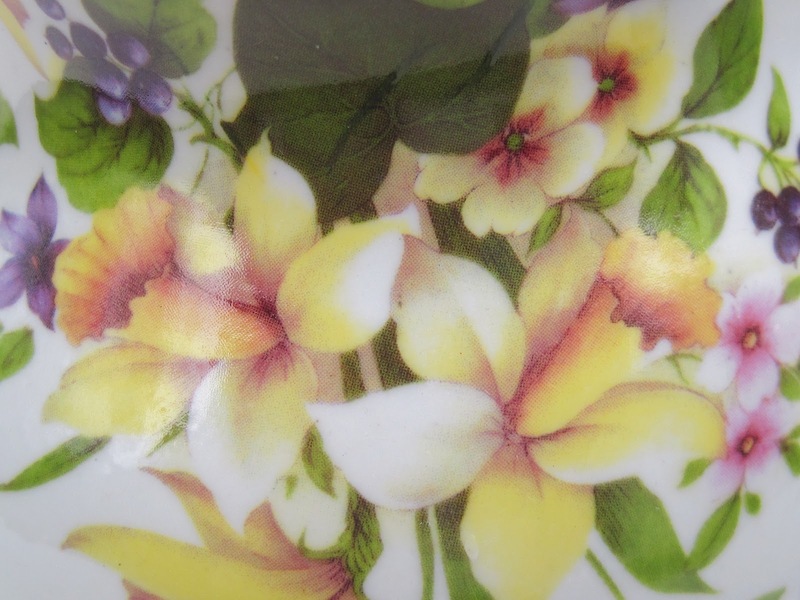 The scent is so wonderful, and it had infused the plastic bag with a lovely citrus scent by the time I got home with it. Using it in the shower leaves the whole bathroom with a yummy fragrance as well. I'll definitely be looking for more of this soap! Earlier this year, I received a free promotional tumbler. I wasn't that interested in the product being advertised, but I was very interested in the tumbler itself because it had a built-in feature I suspected would work very well for a tea lover! This BPA-free tumbler is the VisionUSA TakeOut Tumbler Infuser, and it comes with this infuser basket so you can, as the insert card says, "create your own personalized flavored beverage with fresh, natural ingredients." I loaded mine up with small wedges of lemon and orange. 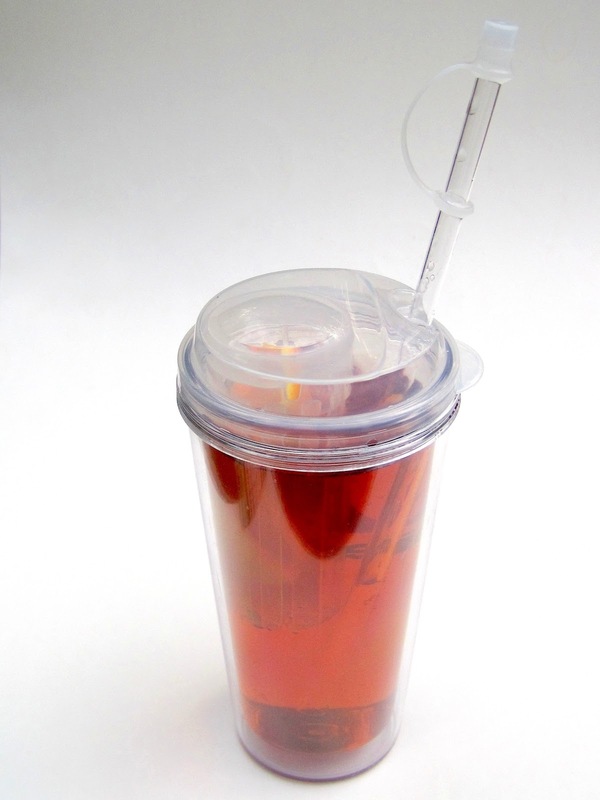 And yes, the infuser basket pops easily underneath the lid, so soon your chilled tea is being infused with fresh fruit flavor! I looked online to see if it was possible to order these individually, but apparently they're sold only in huge lots as promotional advertising products. So that simply means we have to be on the lookout for these at banks, the utility company and other places where nice freebies are given away. I sure love mine! 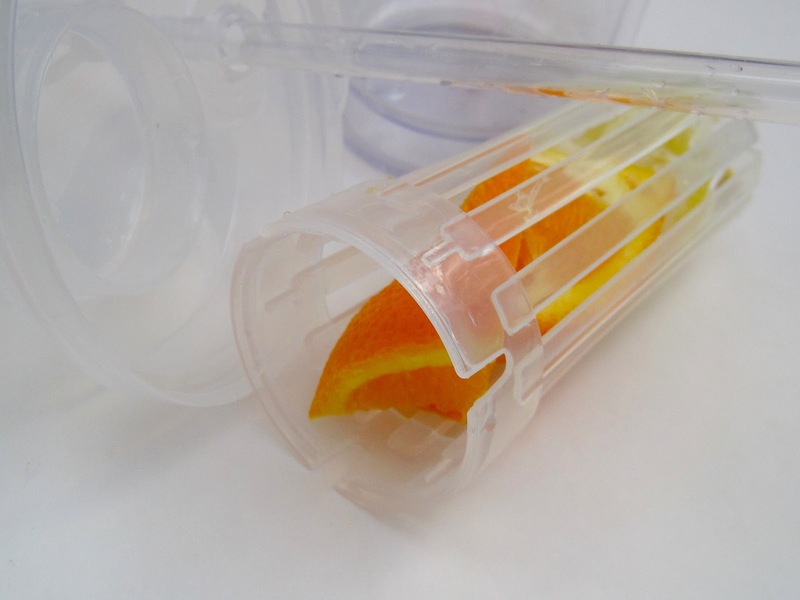 Have any of you tried this infuser tumbler yet? You know how you hear about those old ladies whose corpses are found in their homes one day, their skeletal remains discovered in between stacked-up piles of old newspapers they've saved for the past 57 years? Sometimes, I fear that'll be me one day, only with books. ("Police said they had to remove a hallway full of hardbacks and a half-kitchen full of paperbacks to remove the body, but dental records revealed it was a Mrs. McRae of Newnan, Georgia ...") Even if that happens, I must say I don't believe I can resist a good, cheap book, and vintage ones are some of the most fun to read! 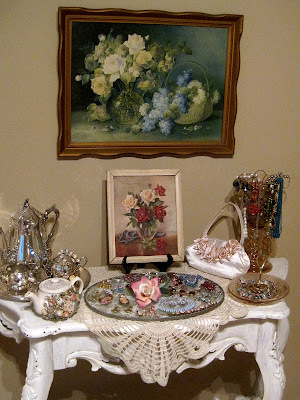 Over the weekend, an antiquing trip with my mom turned up these $1 to $2 treasures. First, "The Art of Serving Food Attractively" by Mary Albert Wenker is a 1951 book with all kinds of cutesy food ideas, such as apricot flowers, for instance. "Cut fresh or canned apricots in sections to form petals. Arrange in design on salad with or without mint leaves. Use a slice of date or large raisin for center of flower." Now doesn't pretty food dress up a tea table? I have always loved that expression, "We eat with our eyes first." 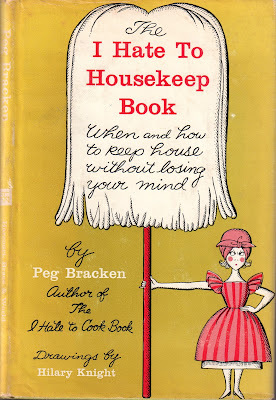 Another book I got was the humorous 1962 "I Hate to Housekeep Book" by Peg Bracken. I actually bought it for the easy recipes at back (a torte made with soda crackers!) 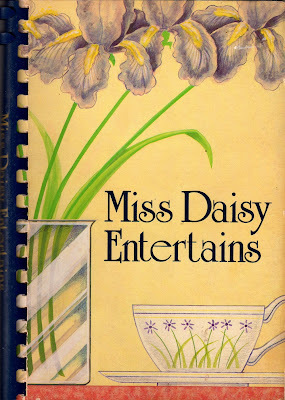 and the drawings by Hilary Knight, best known as illustrator of Kay Thompson's "Eloise" books. 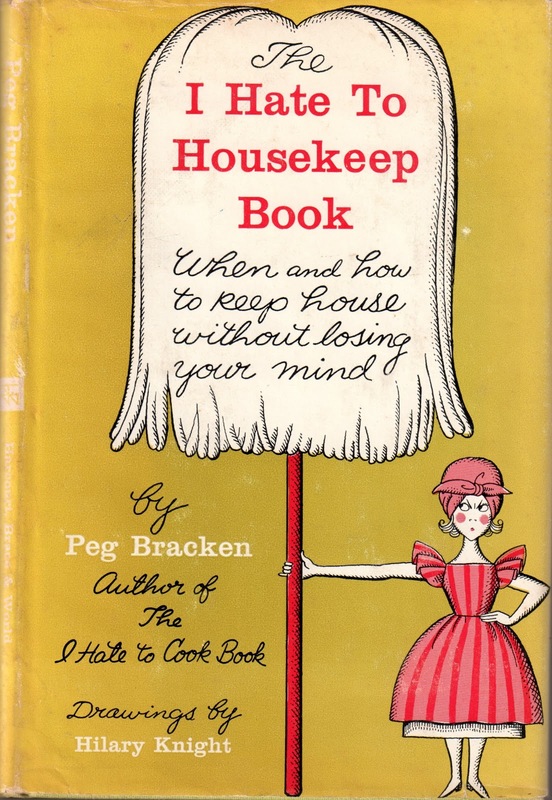 Bracken quotes an old housekeeping book which rendered this advice: "Embarrassment may be avoided if you use pastry brushes with black bristles. Then, should they come out, you will be able to find them easily and can remove them at once." Bracken comments, "I have been embarrassed by many things in my life, but never by my pastry-brush bristles. This is true of most women, I believe. Of all the things one has to blush over in this world, the color of one's pastry-brush bristles comes at the absolute tail end of the list." I like this woman! 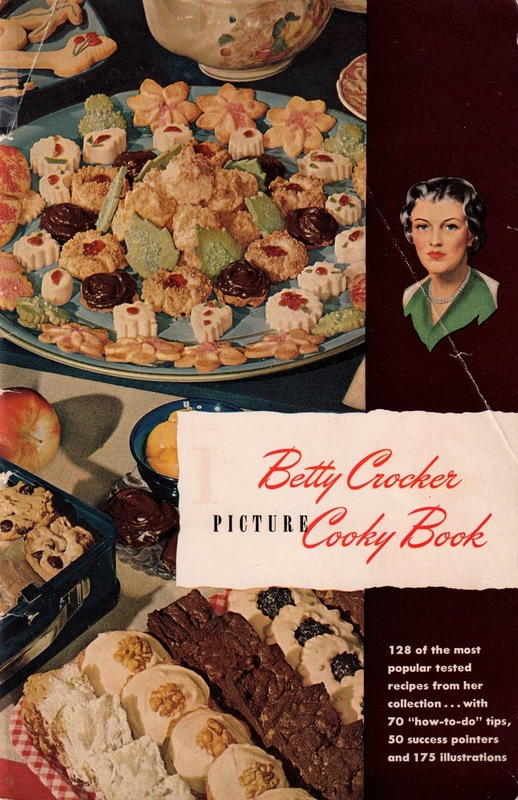 Finally, since I have a hardback version of Betty Crocker's "Cooky" Book, I had to get this 1948 booklet so I may continue to be aggravated by their spelling of the word "cookie." And I must admit that cookie recipes do seem to stand the test of time. 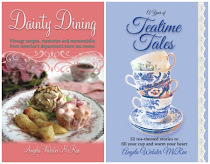 Orange-Almond Refrigerator Cookies, Petticoat Tails, English Tea Cakes, Russian Tea Cakes and Dainty Tea Brownies … there's plenty to go with teatime. 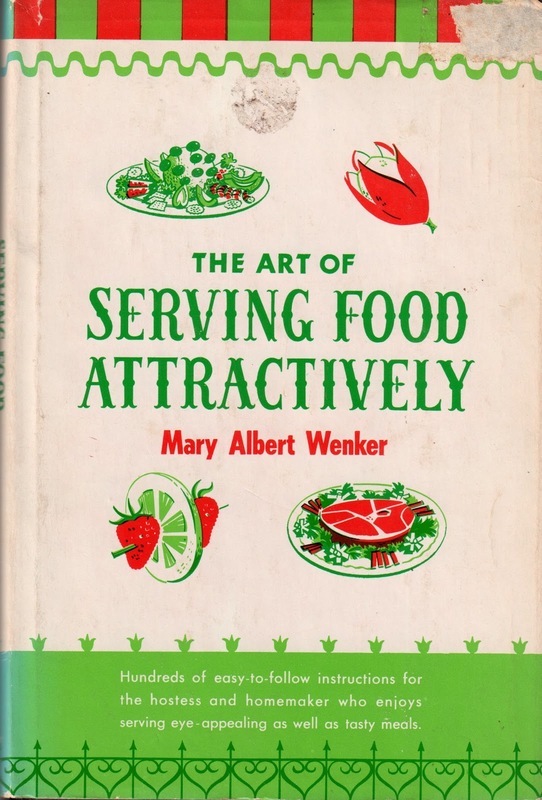 Do you like to read old cookbooks, and do you ever cook with them? I'd love to know any titles you recommend! Have you started planting your teacup planters this year? I got a gift in the form of this pretty lavender plant that mysteriously started blooming in an old dilapidated pot on my deck last week. 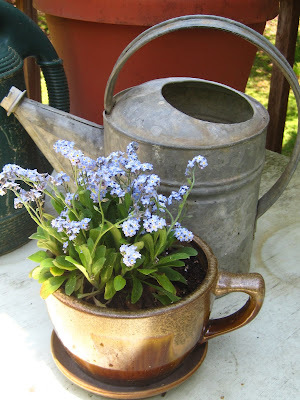 I had planted a few herbs in it last year, then just left the pot with the potting soil in it out on the deck all winter. 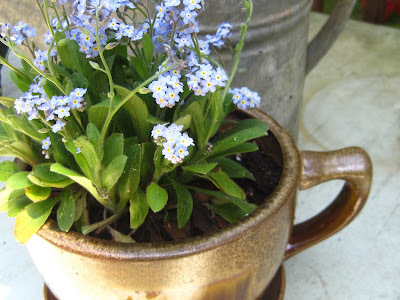 When I saw this lovely surprise, I knew immediately it needed to go into one of my teacup planters. A free plant is always welcome, especially when it's this lovely! I have absolutely no idea what this is. 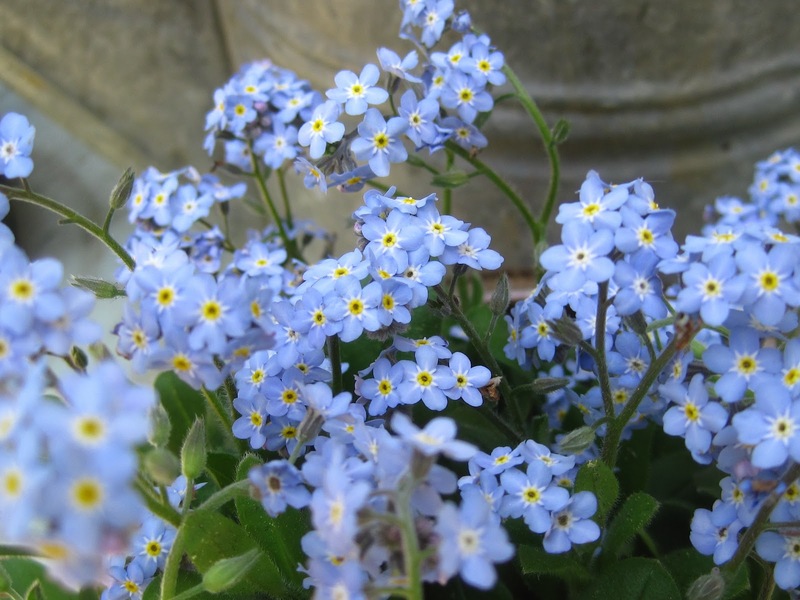 Do any of you gardener friends? I'd love to learn the identity of this little beauty if anyone knows. So, what's in your teacup planters this spring, friends? 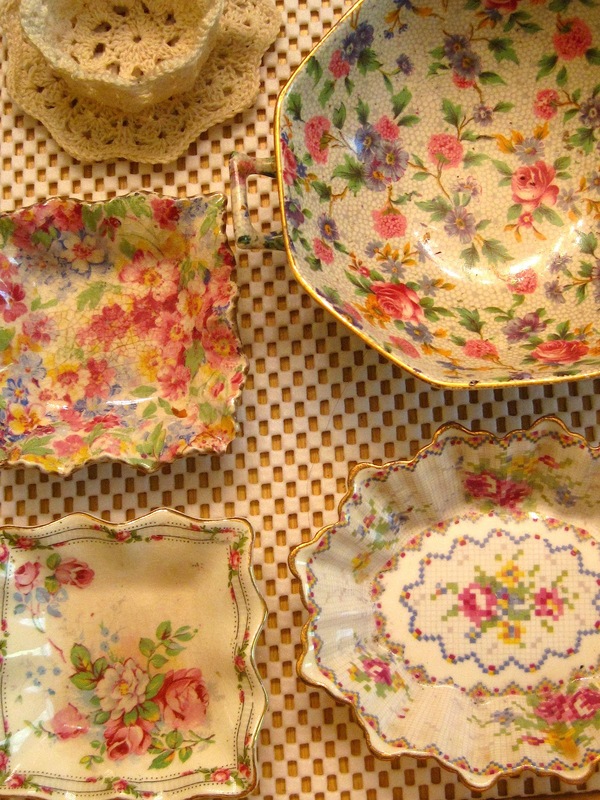 So, why do you suppose I have gathered all these different bits of china? Pretty to look at, yes, but there's quite a useful purpose for them as well. Can you guess? 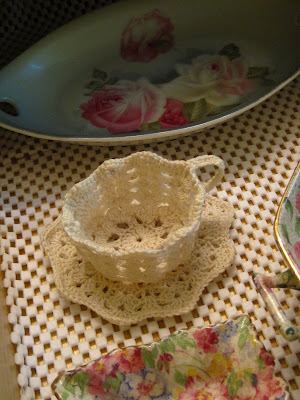 .. and I even pulled in a teacup I crocheted a while back. 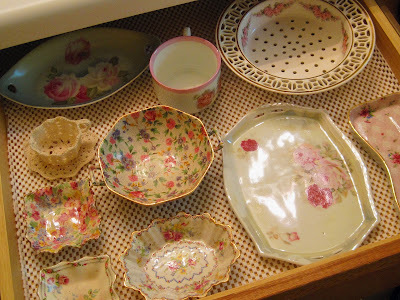 So can you guess why they were all placed in a shallow drawer in my bathroom? Cosmetic organizers! 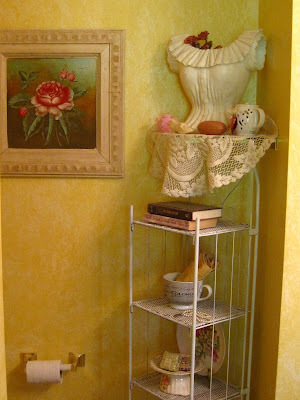 I recently saw this simple idea in a decorating magazine and knew I wanted to try it. The article said to line the drawer with that rubbery shelf-liner paper (I got my roll at the grocery store), and indeed it keeps everything in place so the various pieces of china aren't playing bumper cars when I shut the drawer! 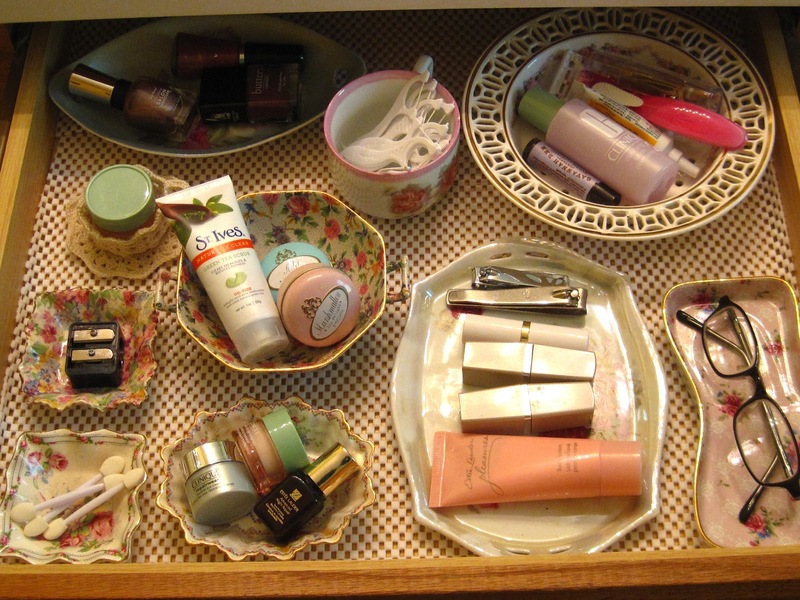 This is definitely prettier than the messy jumble of products I used to have rolling around in there. 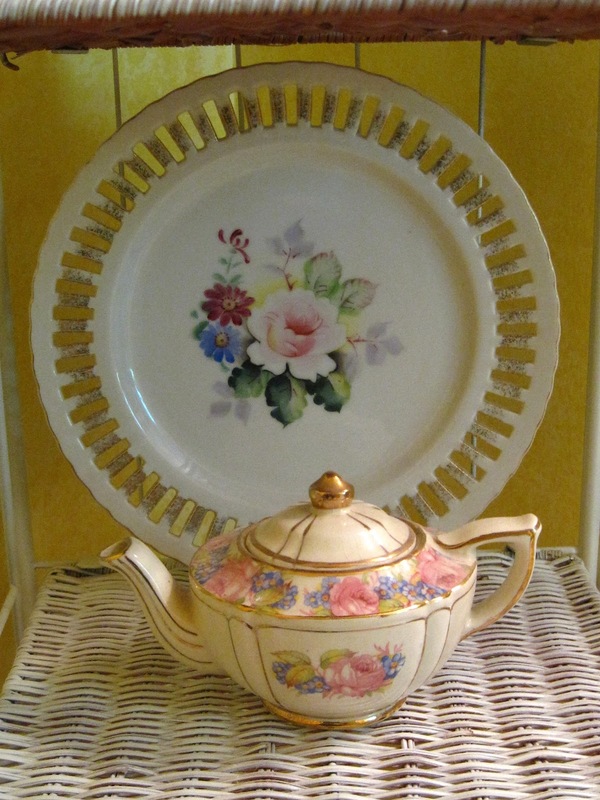 The other advantage is, if I ever need to call these pieces back into service as teawares, they're right there waiting for me, and right where I'll see them every day. Years ago, I watched a Rachel Ashwell Shabby Chic TV program in which she mentioned that even when traveling, she brings along little creature comforts like a pretty, fluffy throw or a scented candle. Why? Because, she said, those days are just as important as the other days in your life, and why shouldn't they all be pretty ones? That's how I feel about my new bathroom drawer "organizers," you see! 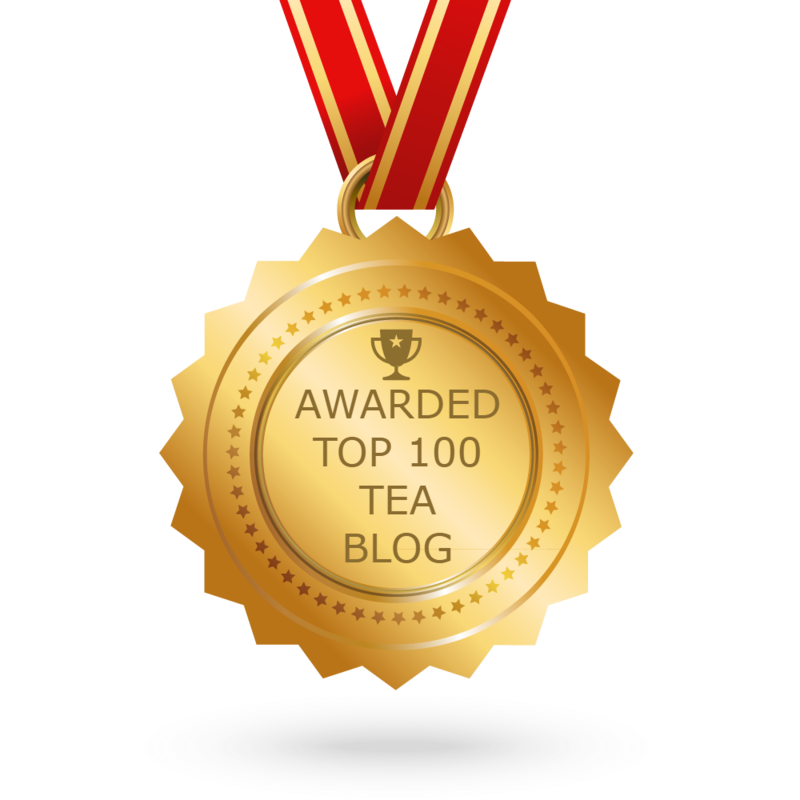 I'm often asked where I put all the things I collect, so I thought I'd mention that I do indeed use my teawares all over the house. When my mom found this little wicker stand for me at a yard sale, I got my husband to paint it white and placed it in a corner of my bathroom. A large cup I bought because of the vintage tea ad on the side becomes storage for washcloths. 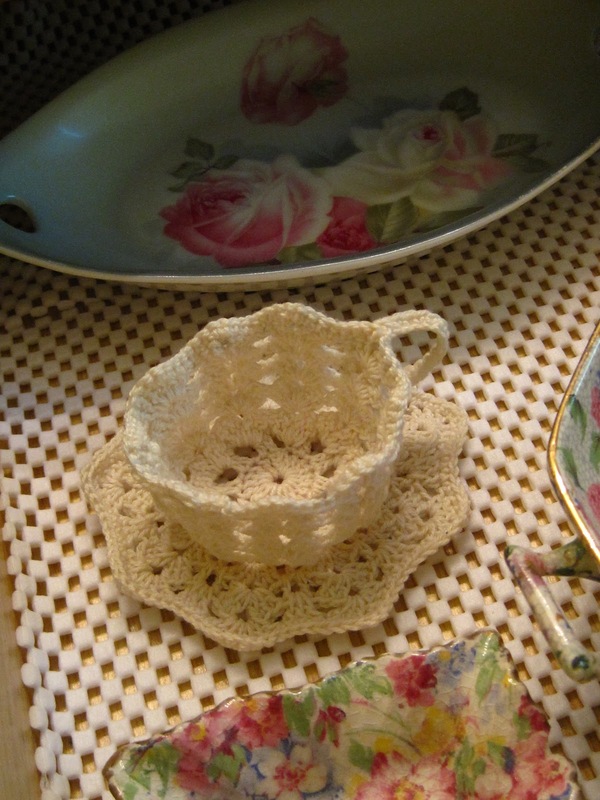 This small teapot holds extra cotton balls, and behind it I placed a pretty plate my mom gave me. 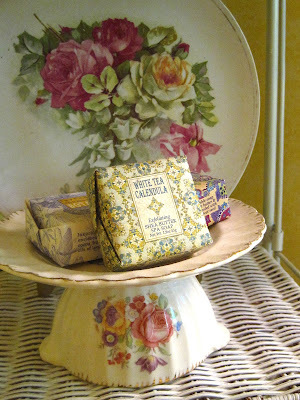 Finally, this little pedestal plate I received as a Christmas gift is called into service for displaying cute soaps. 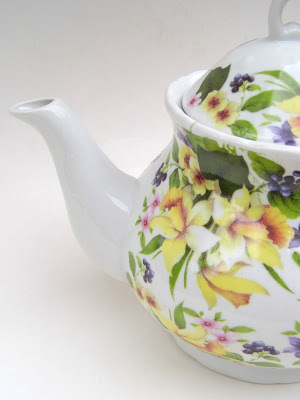 I hope today's blog post gives you some new ideas for non-traditional uses for your teawares. If you find a new one, please let me know! 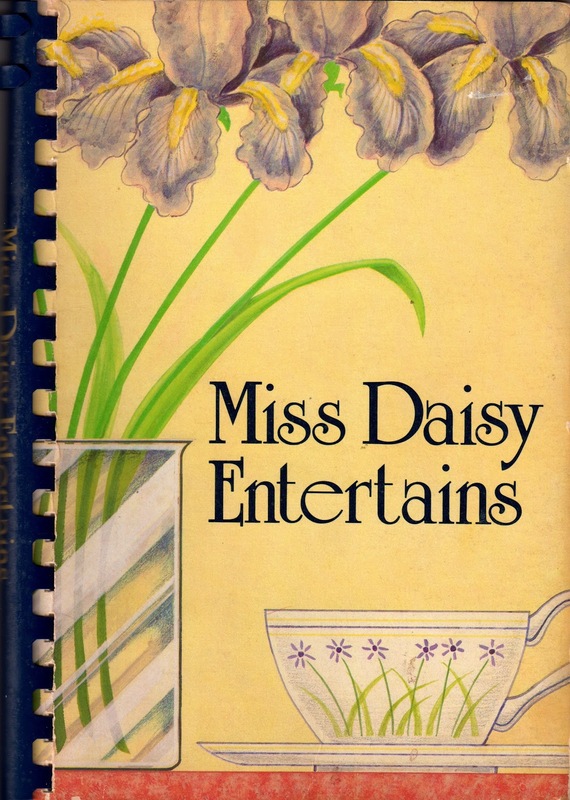 The book "Miss Daisy Entertains" is a 1982 edition of the book by Daisy King, who ran Miss Daisy's Tea Room in Nashville, Tenn. When I found this used cookbook, the previous owner had listed three recipes on the inside cover: the Strawberry Bread on page 139, the Spicy Sausage Balls on page 60 and the Beets with Orange Sauce on page 120. Now I am not a fan of beets, and sausage balls are sausage balls in my book, but the Strawberry Bread appealed to me. And even though I got one ingredient wrong (or did I? -- see below), I was delighted with this moist, delicious loaf! Preheat oven to 325 degrees. Sift together the flour, soda, salt, cinnamon and sugar. 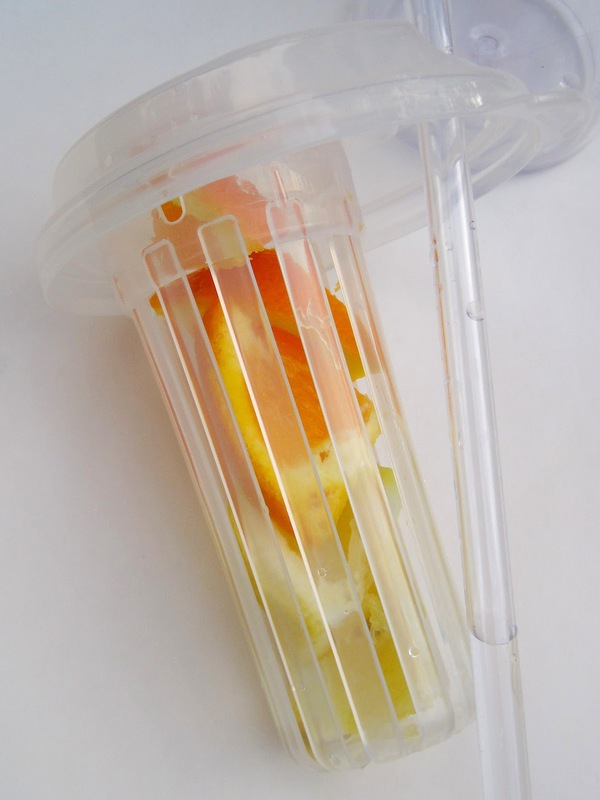 In separate bowl, combine eggs, strawberries and oil. Add wet ingredients to dry ones and combine. Add pecans and blend well. 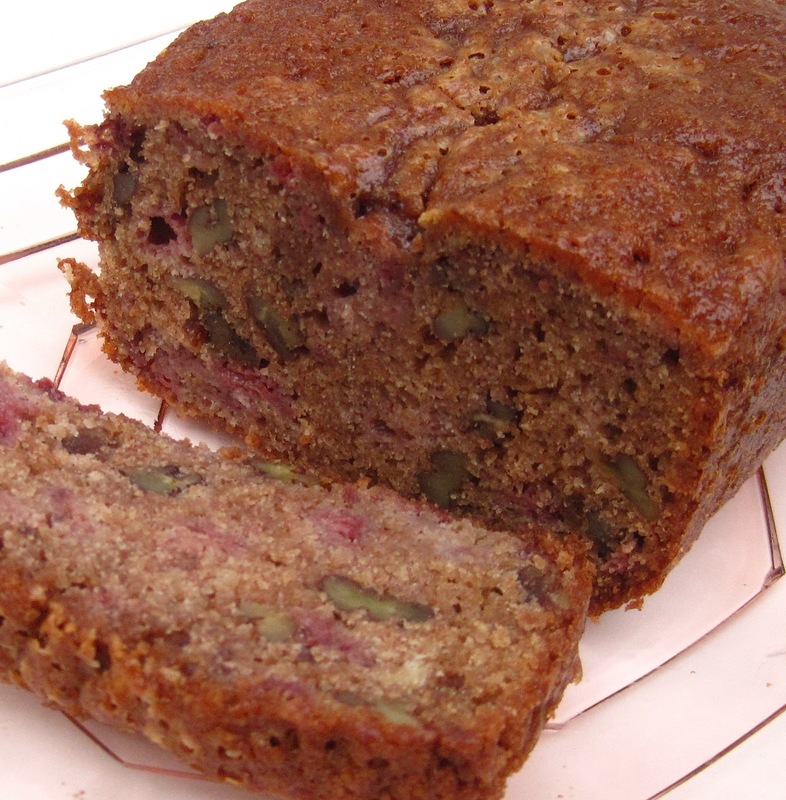 Pour into two 9x5x3-inch loaf pans prepared with cooking spray or lined with parchment paper. Bake for 60-75 minutes or until bread tests done. Cool in pan 5 minutes before turning out onto wire rack to cool completely. *Note: After I popped my two loaf pans into the oven, I started cleaning up and realized that, uh-oh, I had 1/2 cup of oil still sitting there. I had measured out the 1 cup of oil, added it, but then forgot to add the other 1/2 cup. 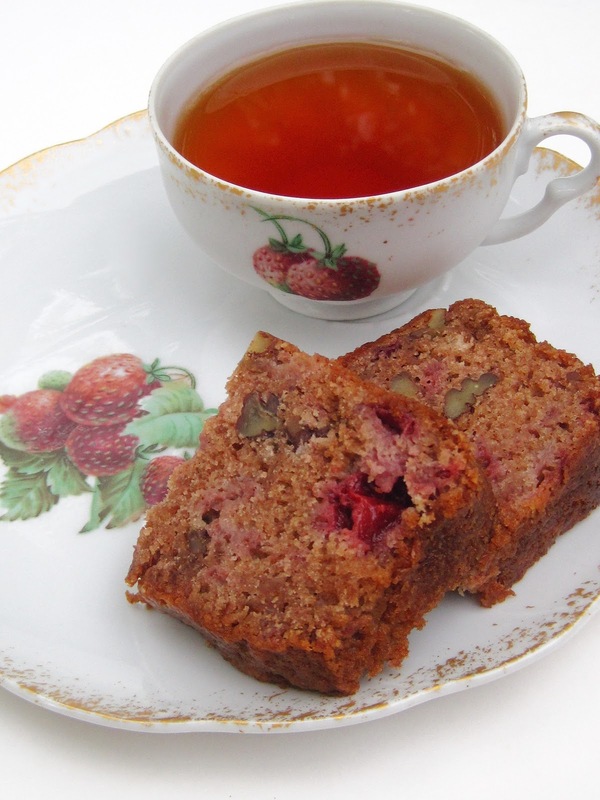 I decided to just go ahead and let the loaves cook, and to my surprise and delight, this was some of the best, most moist tea bread I've ever made! My husband even ate 2 slices! So, please know that yes, the original recipe calls for 1-1/2 cups of oil, but when I make this again I'll use just 1 cup again. Why tamper with perfection! 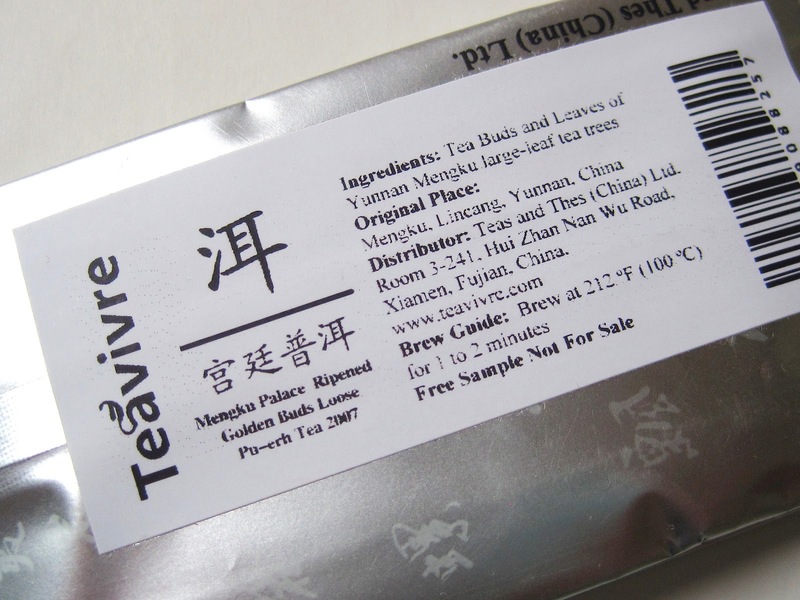 A wonderful woodsy scent greeted me when I opened my latest sample packet of tea from Teavivre. This is Teavivre's Mengku Palace Ripened Golden Buds Puerh, which contains "tea buds and leaves of Yunnan Mengku large-leaf tea trees." 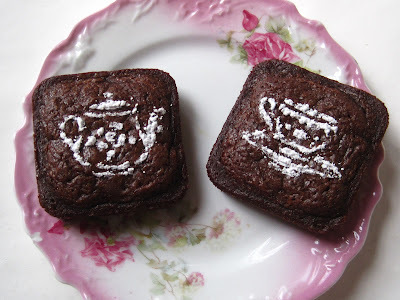 Over the weekend, I conducted a few brief brownie-baking experiments. First, I wanted to see if it was possible to stencil powdered sugar teapots and teacups on brownies. My conclusion? Maybe. These aren't quite as precise as I would like, but I haven't given up on the idea! 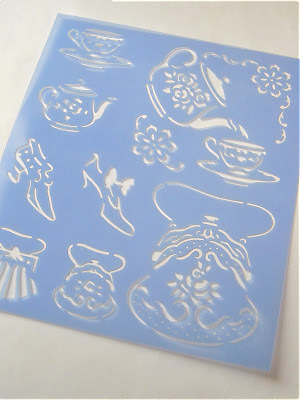 I found the stencil of Sandy Lynam Clough tea designs online. It was a non-eBay auction site, as I recall, but I'm sorry I can't remember the name. You could do a search for "Sandy Clough stencil" if you're interested. 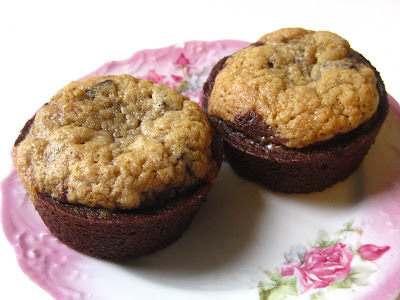 Experiment Number Two: The DH had seen a photo of a muffin-style brownie that was baked with chocolate chip cookie dough on top. Since I wasn't quite sure about this, I just bought some cheap box mixes for both. 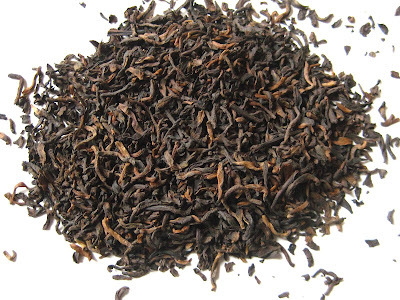 It was actually a tasty dessert, and it paired beautifully with a rich, dark new tea I tried. It was ... well, I better save that for tomorrow! 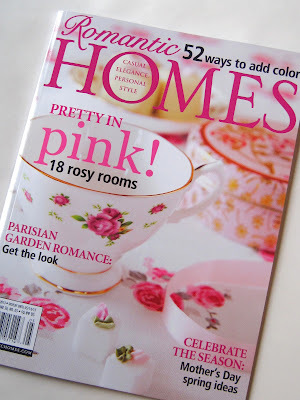 Just when I think I'm starting to get over my lifelong passion for the color pink, something like this has to come along: the May 2013 issue of Romantic Homes magazine. 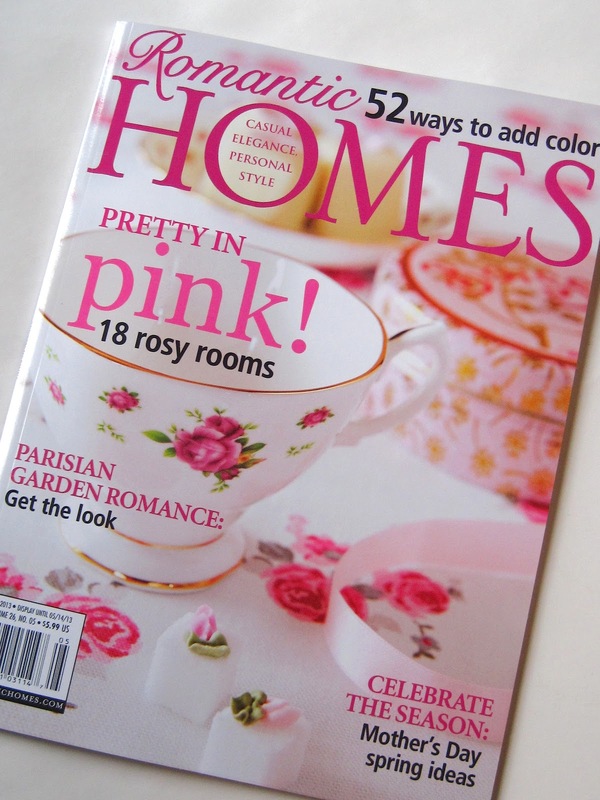 I loved the cover, and it turns out that image was from this charming feature on hosting a Mother's Day tea party. 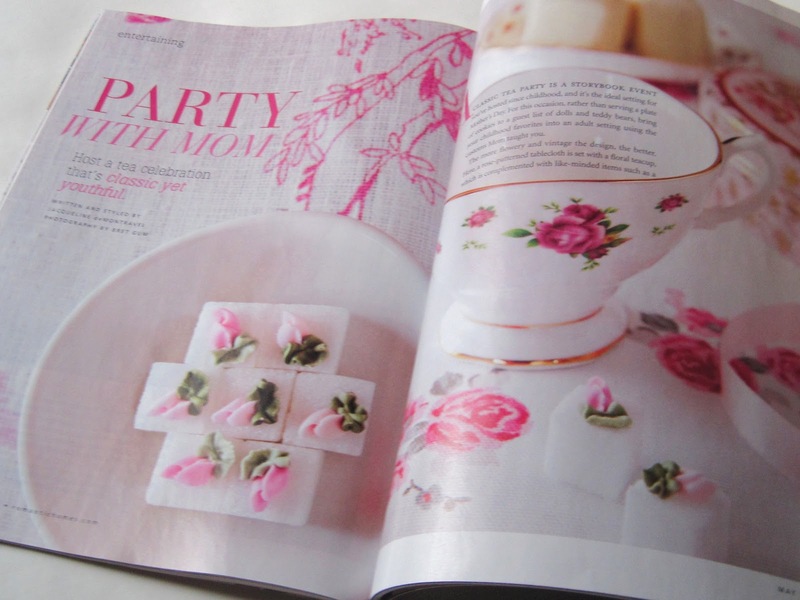 Don't those sweet little rosebud sugar cubes make you want to run set a tea table? 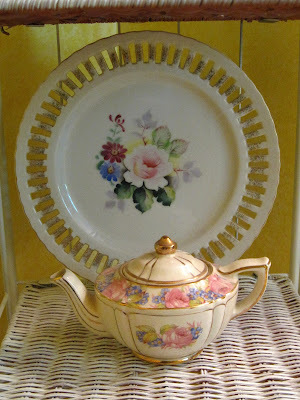 And when I see photos of vintage china like this, well, they have reeled me in, hook, line and sinker. 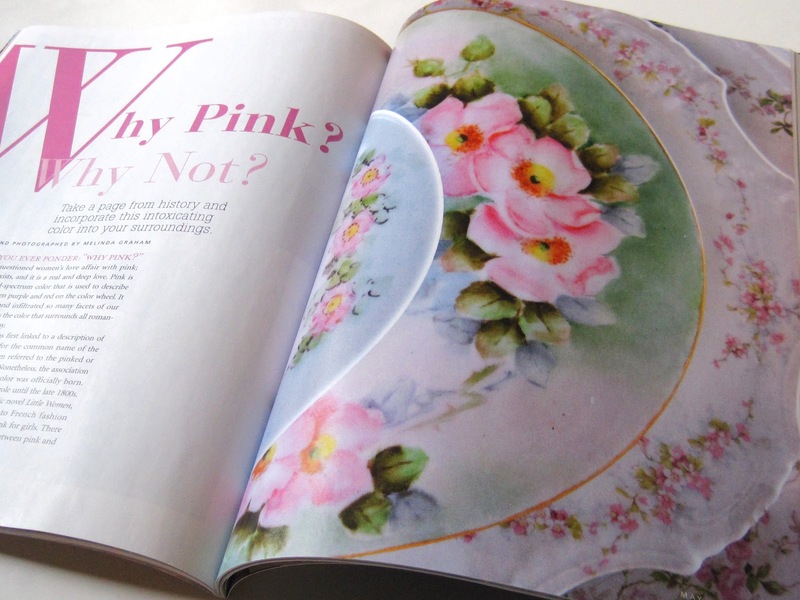 Passion for pink, anyone? 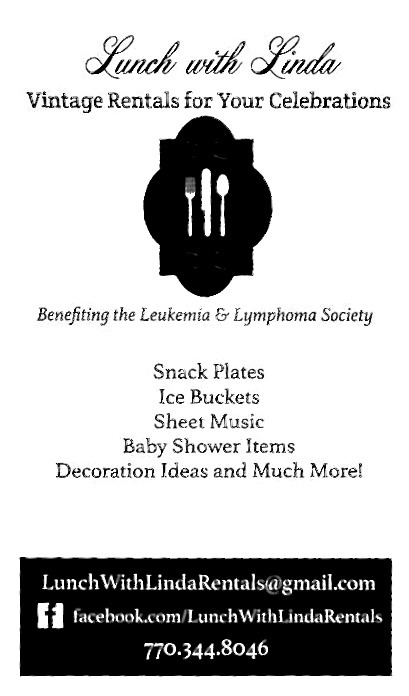 The owners of What's in Store in downtown Newnan, Donna and Warren, are my neighbors two times over. They are my neighbors across the street at the office, and they are also neighbors in that we live on the same street, albeit at opposite ends. 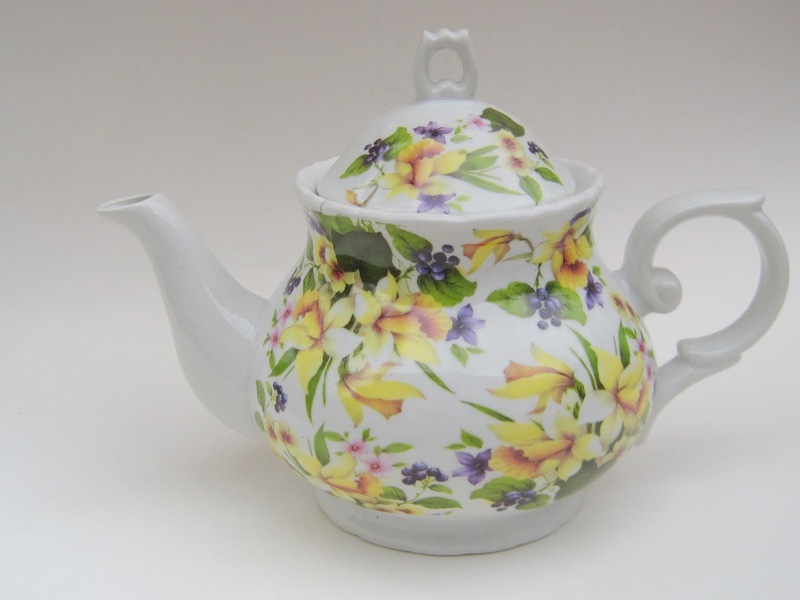 Their store is one of my favorite places to go antiquing, and a visit last week turned up a longed-for tea room cookbook (which I'll feature later this year) and this great new teapot! I mean, seriously, could YOU have resisted this lovely spring pattern with daffodils? 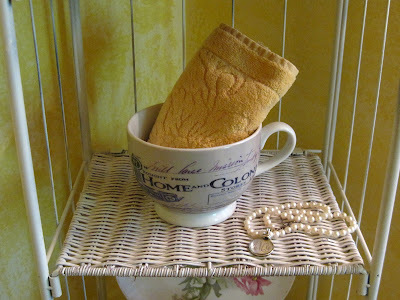 A new tea towel to love!